Focus:Fiber is a biennial national juried exhibition of contemporary fiber art. This exhibition is co-sponsored by the Textile Art Alliance of the Cleveland Museum of Art (TAA), and Kent State University Museum. The show runs March 1-July 28, 2019. I have invitations for private viewing Sept. 28th which is guest list only and complimentary tickets for general admission the 29th and 30th. Please contact me for more information. Hope to see you there! Screening at Genesis Cinema, located in Whitechapel for Experimental Moving Image May 9th, 2018. Sarah Beth Woods will be debuting an interactive installation and film screening throughout the duration of the Terrain Biennial opening Sunday, Oct. 1, 2-7pm. With poem by Crystal Thomas Rudds. Performance: Silent Funny 4-5pm, Saturday June 24th. 4106 W. Chicago Ave.
Below is the link to a newscast in Grand Rapids featuring my work. Friday, August 12th 6:30-7pm I'll be in conversation with Dr. Jeffreen Hayes, Executive Director of ThreeWalls. Join us for a closing reception from 6-10 pm at Rootwork Gallery 645 W. 18th St, Chicago. Exhibition runs through August 14th. This culminating exhibition is the result of Sarah Beth Woods and Fatima Traore's 6-month durational project. The show is comprised of staged tableau photographs and hair sculptures that skillfully weave reality and fiction, using Woods' and Traore's working relationship as a point of departure. Fatimata Traore is a Malian-American professional hair braider, teacher, and entrepreneur. Traore is president of the Illinois Association of Hair Braiders, a member of the African Political Action Committee and board member of Mali Relief. She has recently participated in Chicago-based braiding events at the Gray Center for Arts and Inquiry, the Museum of Contemporary Art, Hyde Park Art Center, and the South Side Community Art Center. Traore is a graduate of the National School of Administration Bamako, Mali. Sarah Beth Woods is a Chicago-based artist who uses the languages of craft, sculpture and public engagement to explore femininity through material culture, artifice and adornment. Her work has been included in shows at the University of Michigan's Work:Detroit space, Girls Club, Fort Lauderdale, Florida, A.I.R gallery in Brooklyn, New York, the Bob & Roberta Smith Kunstverein at Coventry University, Coventry England, NYU Florence, Florence Italy and in Chicago at the Museum of Contemporary Art, Western Exhibitions, The Franklin, Hyde Park Art Center, and Woman Made Gallery. Woods and Fatimata Traore are the recipients of the 2015/2016 Crossing Boundaries Prize through Arts+Public Life & Center for the Study of Race, Politics and Culture at the University of Chicago. Additional programming: Join us for an artist talk and demonstration moderated by Tracie D. Hall Sunday, August 14th, 2-5pm. Join us for a special culminating reception and catalog release for APL/CSRPC Crossing Boundaries Artists-in-Residence BRAID/WORK: Fatima Traore and Sarah Beth Woods. BRAID/WORK is a collaboration that crosses over and through the disciplines of performance, sculpture and social engagement. It speaks to the history and aesthetics of handwork and braiding culture as well as possibilities for shaping new conversations and material forms. 1:15 - 1:30: BRAID/WORK catalog introductions by Tracie Hall and Cecil Mcdonald Jr. Event is free and open to the pubic. Fatima Traore and I were interviewed by Richard Steele on the Barber Shop Show Friday, May 6th. Program airs Sunday, May 8th at 3pm on 91.5 WBEZ. 645 W. 18TH ST. EXHIBITION RUNS THROUGH AUGUST 14. 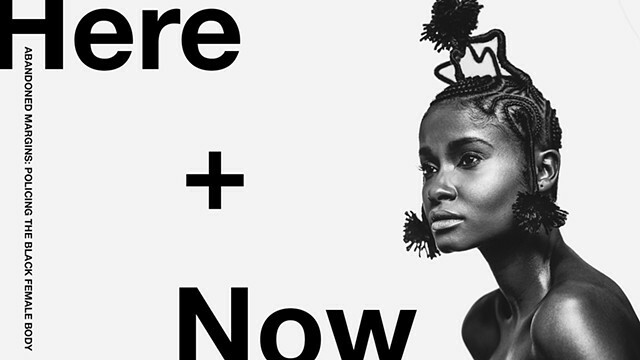 Fatima Traore and I have a new website up for BRAID/WORK. Please visit the page for more information and updates. Fatima Traore and I have been awarded the 2015/2016 Crossing Boundaries Prize through Arts+Public Life & Center for the Study of Race, Politics and Culture @ the University of Chicago. Fatima Traore and I will be holding several open braiding workshops in different locations throughout Chicago between January and May of 2016. Select fiber samples from the sessions will be assembled together to create larger sculptural works that blur the line of authorship between Fatima, myself, and the participants resulting in a new series of collaborative sculptures. Many thanks to Wheaton faculty and staff for their generous support. This show includes sculpture and photo documentation from my durational project, complete with pop-up nail salon at the closing reception. Featured panelist for this event include Soheila Azadi, Sarah Beth Woods, Mike Andrews, and Jessica Caponigro. Lori Waxman did a nice write up about the Terrain Biennial in Oak Park, IL featuring my installation at 720 Highland Ave, Everything is Beautiful. There's also a nice mention about our pop-up nail shop. Sarah Beth Woods on nails, Soheila Azadi eyebrow threading, and a gorgeous interactive, vinyl tablecloth by Maurene Cooper. Taking place during EXPO ART WEEK, The Annual is a yearly sales exhibition celebrating cutting-edge Chicago-based artists. Arranged by two guest curators, The Annual creates an accessible forum for emerging collectors to discover affordable new work and engage directly with its creators. Join me from 6:30-8pm. 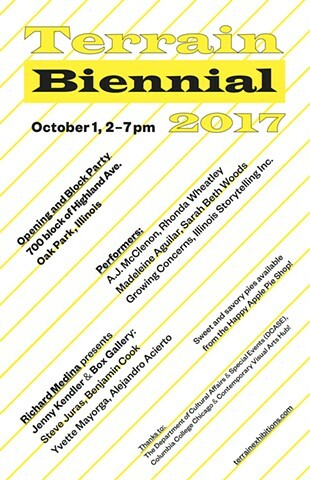 I'll be participating in the artist talk moderated by Alexandria and Claudine. I recently had the pleasure of showing new work in Esthetic Theory, a group show curated by Rose Romero at Girls Club Collection in Fort Lauderdale, FL. Show opens Wednesday, May 27th and runs through the 29th. Check out the link below for images and artist statements. Free and open to 9-12th graders. Participants must register in advance on the MCA website. Celebrate and explore crafting as a radical feminist form of production and economy. Tracers Book Club will lead workshops and demonstrations in zine production, printmaking, nail art, and more. Participating artists include Lise Haller Baggesen & Eleanor Ross, Sarah Beth Woods, Fatima Traore, Soheila Sima Azadi, and Jessica Caponigro. In January of 2015 I was invited to team teach Critical Craft Circle at Smith College with Laura Anne Kalba (Associate Professor Department of Art, Smith College.) The course bridges the worlds of history, theory, and practice through equal parts in-class discussion and hands-on craft/art-making. Participants in Critical Craft Circle constructed a colorful, finger-knit basketball net using the NCAA's (New Craft Artists in Action) Net Works publication, which was installed and left in the gymnasium at Smith College. Last minute additions included hot pink and glittery blue pom-poms. We asked a group of four men who were practicing on the other side of the gym to try out our net. They quickly divided into groups and played a round of two on two. The long, mismatched tendrils of yarn sway back and forth every time a ball is shot through the hoop. We manically snap pictures with our cellphones, hoping to capture the ball hovering just above the net. When asked afterwards what their experience was like the tallest one in a white jersey with the number 33 printed on the back paused, wiping the sweat from his brow, "The nets length is definitely not regulation, but...the aesthetics are great!" Painting and embellishing nails today, January 17th, at The Botaniste 101 Main Street Easthampton, Massachusetts from 2-4 pm. I was named one of the top five Chicago artists in the Subversively Conceptual Crafters category. Honored to have my artist profile published in NewCity magazine. Join this Chicago Detours walking tour that is featured for Chicago Artists Month, highlighting Bricoleur at Azimuth projects. I'll be giving an artist talk on October 26th at 2pm. If you aren't able to make the walking tour join us for the talk and closing reception that are free and open to the public. Fatimata Traore will be sculpting and braiding guests hair, and I'll be painting nails from 12pm-5pm Saturday, September 13th at the Hyde Park Art Center. 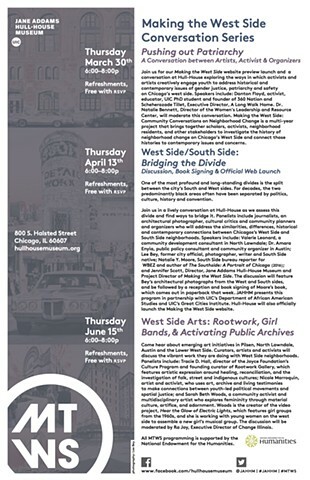 Hyde Park Art Center’s 75th Anniversary Block Party BBQ Bash is free for all and represents a moment for Chicagoans to come together and celebrate our city’s artists, the community that embraces them, and the Art Center’s legacy of supporting both. Azimuth Projects is pleased to present Bricoleur, an interactive installation created by Sarah Beth Woods and hair braiding experience by Fatimata Traore. Woods produces sculptural works made of brightly colored hair extensions, found objects, textiles, and chains as a means to explore identity, beauty culture, and femininity. Traore is a professional hair stylist who has been practicing African hair braiding for over 20 years. These two artists will create an experience that bridges sculptural materials and the craft of hair braiding. Hair braiding is first come first serve with a suggested $10 donation. Jeloff rice with chicken and vegetables will be served in tasting portions. Join us Thursday, August 14th from 3-5 pm for an afternoon immersed in the art and culture of hair braiding at the South Side Community Art Center located at 3831 South Michigan Ave, Chicago, IL. Bringing together braiders who practice in both formal and informal economies, and visual artists who employ the craft of braiding, we will investigate the techniques, politics, traditions, and tensions created within these complex spaces. The event will be followed with an informal panel discussion. This event is sponsored by the Jane Addams Hull-House Museum in collaboration with The Illinois Association of Hair Braiders, a coalition of professional braiders, natural hair stylists, and entrepreneurs across Illinois that are committed to teaching the tradition and craft of hair braiding nationally and internationally. Join master artists/crafters for this exciting day of workshops where we consider the relationship between feminism and craft. Panel discussion to follow the workshops at 4:30 pm. Workshops include constructing a collaborative sculpture made of bath poufs, doll-making, quilting, zine production, knitting, tie-dye techniques, printmaking, nail tip design, hair braiding and more. Being interviewed on a Chicago radio station at 1pm Thursday, November 21st. The station can be streamed online from anywhere in the country at www.que4.org. Going to be discussing my work and give a big shout out about the Hip Hop and Punk Feminisms Symposium I'm performing in December 5th and 6th at the University of Illinois at Urbana Champaign. Fourteen full-time and adjunct art faculty at Harper College will exhibit their work in the bi-annual Faculty Art Exhibition, on display now in the Art Exhibition Space, C200, Building C on the College's main campus, 1200 W. Algonquin Road in Palatine. The free exhibit is open to the public Monday through Friday, 8:30 a.m. to 4:30 p.m and will close on September 26. The exhibit will feature photography, sculpture, print pieces and more – all forms that represent the kinds of classes offered at the College. I had the pleasure of working with Sonya Clark this past July at Haystack Mountain School of Crafts in Deer Isle Maine. While in residence I created Nails, a collaborative 2- week durational performance where I constructed a nail salon and designed customized fuchsia pink nail tips for Haystack participants by appointment. I was struck by the intimacy that was created within that public space, the personal anecdotes people shared, and the trajectory the nails traced from Chicago to Haystack and beyond. 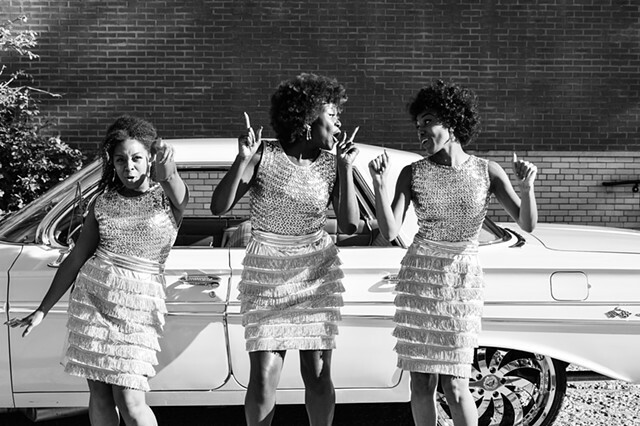 The photographs themselves represent a dynamic range of relationships. For the Haystack auction I created a customized set of 16 nails that is now in Sonya Clark's private collection. This is an ongoing project, so please check back for updates. "Little Man Pee Pool Party: The Whiz Paddler's Lament" will consist of at least twenty idiosyncratic versions of Mannekin Pis, the famous "peeing boy" public fountain in Brussels, made by a variety of professional sculptors, artists, and non-artists alike. Each piece will be fully functional and will pee into a series of shared indoor pools. A twenty-six page catalog will accompany the exhibit with contributions by many of Chicago's most dynamic young cartoonists. Design Cloud Gallery presents Embody, a performance art exhibition featuring artists Claire Ashley, Baccara (Madeleine Bailey and Helen Maurene Cooper), Alexandria Eregbu, Karen Faith, Anni Holm, HUB (Victoria Bradford), Meredith and Anna (best known for their curatorial project, Happy Collaborationists), Joseph Ravens, and Sarah Beth Woods. During the opening reception I will be performing Cut, Clean at 6:30 pm. This performance is part of an on-going series that utilizes performance, sculpture, and adornment as a means to investigate the material facts of my body, lived body experiences, and the materiality of the feminine. Hot pink acrylic nails and hair weaves serve as exaggerated extensions of my body, used to carve out a distinctively feminine space. A collaborative score will be created by audience members during the performance. The Franklin is pleased to announce Methodic Deconstruction, an installation comprised of the works by artists Katya Grokhovsky, Tracy Ostmann, Sarah Weber and Sarah Beth Woods. Domestic life and studio practices could become collateral at their core. A chair, a table, a lamp and a painting, resonates when their pragmatic qualities are being tampered with. Methodic Deconstruction explores the relationship between representation and abstraction and the spaces in-between. Lecture in Room 103: 11:00 - 12:00 p.m. Join us for a presentation of Sarah Beth Woods' past works and ongoing investigations. During our workshop in Alberto Aguilar’s advanced studio course we deconstructed and reconstructed bath poufs, adorned them and created a public procession down Lake and Wabash streets in the Chicago loop. Please check back for updated photos. At 3:00 I'll be performing Pour some sugar on me, an interactive piece that involves lots of baked goods, pink frosting, and sprinkles. Check out the link below for more details. You can download a free PDF version of my ebook published on lulu.com. The book contains images of my studio process and research that led up to my MFA thesis work. The second half of the book contains sculptural works completed at the University of Illinois at Urbana Champaign from 2009-2012. My hardworking cohorts and I will be exhibiting our thesis work. This is one show that is not to be missed! The title, after both the Cole Porter song and another by the Talking Heads, is meant as an ironic gesture signaling the paradox of selling created need; that is, to make consumers want what you tell them to love. LOVE FOR SALE, the exhibition, is meant to address the image as a means of selling, of creating need. Group show at Figure One in downtown Champaign, IL. Works included in this exhibition concentrate on the nature of knowledge. What do we know, how do we come to know it, and what are the limits of knowing? In scholarly research, what is accepted as “known” must be validated by professionals in that field. This exhibition engages with the peer review process through both its content and its structure. The jury process for this exhibition mimicked these collective validations of knowledge by allowing applicants to serve as a pool of experts who then collaboratively determined which work would be included in the show through anonymous written reviews. Chicago celebrated two fairs recently, but the real action is in the art schools. Herewith, photos from the graduate exhibitions of three Master of Fine Arts programs: The University of Illinois at Urbana-Champaign, which took place at Co-Prosperity Sphere; the Center for Book & Paper Arts at Columbia College’s Thesis Exhibition; and the School of the Art Institute’s MFA Show at the Sullivan Galleries and the Wabash Gallerie.